When looking for the best dog food for a German shepherd puppy, the options can seem staggering. When you go to the store, you will likely see an entire aisle filled with bags of canine cuisine, each one claiming to be the best. The first thing you need to understand is the claims made by any company must be taken with a grain of salt. After all, these company want your money, and they don’t necessarily care about you or your dog. The German shepherd is a large and energetic breed. This is a dog that has been used for so many different work purposes that people cannot even agree on which task they perform best. However, we know they are known to be good at herding animals and helping the police deal with dangerous criminals. All of these purposes require a high-energy animal, and that equals a fast metabolism. Because of this, any food you select for your German Shepherd should be as nutrient-dense as you can afford. This breed is only slightly different from their wolf ancestors (be honest…that’s part of why you wanted a German Shepherd! ), and so they should never be given cheap dog food full of wheat, corn syrup, and other fillers. Be sure to choose a brand of dog food that has the right proportion of ingredients. Protein is an important factor, which is why you should make sure your chosen brand contains at least 22% protein. Any less will compromise your dog’s ability to maintain its required energy level. Fat is also important for the health of your German Shepherd’s skin and coat, but too much will result in a lazy butterball dog. The food you select should have 5%-8% in total fat content. Carbohydrates are also essential for proper dog food processing. This is less important for predatory animals, but far from unimportant. Any food you select should have from 5% to 8% carbs. Be aware, however, that not all sources of nutrients are equal. The ideal diet for a German shepherd would be a plate of fresh meat, served every day on a silver platter. Unless you are well off, you probably cannot afford that. However, you can at least stay in the ballpark and select food made from wild and natural ingredients. Nutrient requirements for this breed are demanding due to the size and energy of the breed. However, a growing German shepherd puppy needs even more and you need to know how to feed a German shepherd puppy. Your puppy isn’t just trying to maintain its existing size and weight. It is trying to grow, and if you want them to grow big and strong, it needs more than just the typical amount that would be required to maintain its current size. We should begin by talking about the nutrition of the mother. A canine mother requires extra food and better-quality food when nursing her little ones. As such, a responsible breeder will designate a higher-nutrient food (such as puppy chow) for the mother to eat while nursing. Breeders should also give her supplemental amounts of meat and fresh vegetables. To have healthy pups, you must first have a healthy mother. When you select a breeder from whom to buy your pup, make sure you get a good look at the mother. From weaning all the way up to six months, your puppy should be offered food three times a day. For some dogs, you can get away with two feedings a day. German shepherd puppy food has to be dense in nutrients. However, their size makes it important not to overfeed. Larger dog breeds can often suffer from skeletal and joint issues as they get older, and overfeeding will worsen the issue. Make sure you keep an eye on how fat your pup looks and adjust their food intake accordingly. A 12-week old German shepherd can begin to eat like an adult dog. While they will still have some growing to do, there will no longer be a need for the same special attention. That being said, you still need to give it enough to maintain a nice robust girth. A 2-month old German shepherd will have put on some significant size and will require an increase in food intake. A one-year-old German shepherd can be switched to a fully adult diet and given a slight reduction in their food intake. For feeding your German shepherd puppy, you need a high protein food. Once they reach adulthood, this is not quite as important. However, a growing puppy needs plenty of protein because it is the most important nutrient for any meat eating animal. 22% protein is considered a minimum for this breed, but you should shoot for something higher. A German shepherd diet should also include a reasonable amount of carbohydrates. Carbohydrates provide energy in a form that can readily be stored, and will normally come from plant-based sources. Be mindful of the source of carbohydrates as cheap foods contain a lot of wheat, where rice is a far superior source. Fats are essential for the health of your dog’s skin and coat. If you look at the nutritional content of dog milk, you will see it contains more fat than protein. This gives us a clue about the importance of fat to a growing dog. Just make sure you don’t overdo it, or you will end up with a fat German shepherd puppy. When choosing food for German shepherds, this is a feature you don’t need to worry about as much. Vitamins and minerals are very important to your dog’s overall health, but the sources of those vitamins and minerals won’t make a huge difference. You will find below a list of the various minerals that will benefit your dog and from where they are usually derived. Have you recently adopted a German Shepherd puppy and tried to compare different puppy foods at your local store? We know that deciphering the true nutritional value of each formula can be daunting. 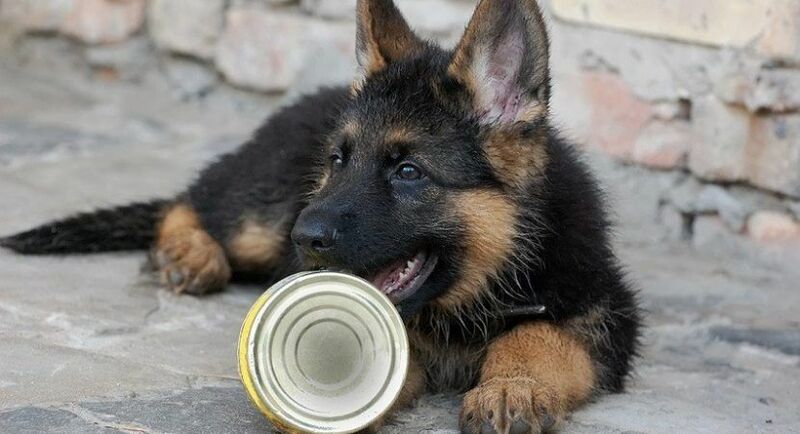 Below, we’ve compiled a comparison of the top 10 dog foods for German Shepherd puppies to help you focus on the important stuff. Eukanuba has been one of the leading dog food brands since 2014. This formula features an average fat-protein-carbohydrate ratio when compared to other dog foods and an optimum amount of DHA. This product is a good choice for any new German Shepherd owner looking for a balanced formula that promotes brain development. According to the standards of the Whole Dog Journal, this formula meets the protein, fat, and carbohydrate requirements for ideal puppy development. Its fat-to-protein ratio is within the journal’s standards at about 55%. While Eukanuba’s large breed puppy food contains by-product meal as its main source of animal protein, it is a balanced formula within professional standards of puppy nutrition and provides a competitive amount of DHA for healthy brain development. Royal Canin is another leader in the pet food industry. This recipe is breed-specific, combining ingredients that support German Shepherds’ sensitive digestive systems and joints. This formula is a good choice for an owner who wants to tailor their puppy’s diet to combat breed-specific health issues. The product meets the ratio standards of the Whole Dog Journal and has an average fat-to-protein ratio of 50%. Though this formula boasts breed-specific benefits for German Shepherd puppies and contains a relatively high level of Vitamin E, the quality of the ingredients in this recipe are questionable. This product is developed specifically for large dog breeds. When compared to other dog foods, this formula contains a competitive amount of vitamin E. This is a good choice for owners looking for products that support immune health. The ratios of this formula meet the standards suggested by the Whole Dog Journal. 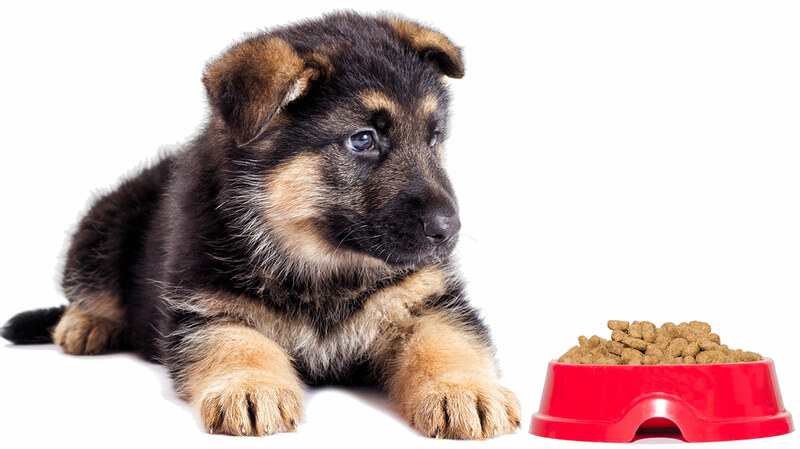 The fat-to-protein ratio is identical to the Royal Canin German Shepherd Puppy Food at 50%. This puppy food is nearly identical to the Royal Canin German Shepherd Puppy Food in its ingredient list and nutritional value. Like the previous Royal Canin product, this formula includes a large amount of filler ingredients with little nutritional value. Diamond Naturals is the fifth-largest pet food manufacturer in the USA. This line of products incorporates a blend of probiotics, superfoods, and antioxidants in each formula to support growing immune systems. This is a great choice if you are looking for a formula with high-quality ingredients that targets immune health. The protein, carbohydrate, and fat ratio of this formula meets the standards of the Whole Dog Journal and is comparable to other similar large breed puppy foods. This Diamond Naturals product is considered an above-average formula with high-quality ingredients and a strategic blend of probiotics and fatty acids for immune system support and brain health. One concern we have with this brand is its 2012 recalls. Blue Buffalo is the fastest growing pet food brand in the USA. The brand’s focus is to keep each formula simple with high-quality ingredients. This product is a great choice if you are concerned with excessive fillers in your puppy’s food. This protein content is significantly above what is recommended by the Whole Dog Journal, which contributes to the below-average fat-to-protein ratio. While all dogs need protein to grow and maintain muscle, too much protein can cause kidney problems and bone density loss. Your German Shepherd puppy may benefit from the wholesome ingredients but could suffer the consequences of a high-protein diet. Hill’s Science Diet is a leading pet food brand with global support from veterinarians. The focus of this brand is to create recipes that are clinically-proven to keep your puppy healthy. This product would be great for a German Shepherd owner looking for a formula backed by the world’s leading veterinarians. The protein content of this puppy food is moderately above the recommendations of the Whole Dog Journal. Its fat-to-protein ratio is average. This formula has an above average fat-to-protein ratio, but it is not high enough to be concerning. Its above-average levels of DHA and fatty acids insures healthy brain development in your growing puppy. Fromm Family Foods is a business with a rich history. They claim to be the inventors of the first granular dog food. This product is a great choice for a pet owner looking to support a smaller family business. This formula meets the protein, carbohydrate, and fat standards suggested by the Whole Dog Journal and has a typical fat-to-protein ratio. This recipe seems well-balanced and includes a number of vitamins, minerals, and fatty acids for optimal development. That being said, this is a great choice for new puppy owners looking for a small pet food brand with a quality product. The main difference between Blue Buffalo’s Freedom and Wilderness formulas is the protein content. While the Wilderness formula contains a high ratio of protein, this product is more comparable to an average dog food. It is a great choice for your average German Shepherd puppy. This ratio meets the standards of the Whole Dog Journal and has a typical fat-to-protein ratio when compared to similar products. While this product contains some questionable ingredients, it is a good choice for your typical German Shepherd puppy, offering a balanced amount of protein, carbohydrates, and fat with generally high-quality ingredients. Orijen is an award winning pet food company, receiving significant praise for nutritional innovation, food safety, and sustainability. Ingredients for their pet food are sourced regionally and are of remarkably high quality. This is a great choice for any growing German Shepherd puppy and for environmentally-conscious owners. The protein content is rather high and exceeds the suggested protein ratio from the Whole Dog Journal. The carbohydrate content is considerably low when compared to other puppy foods. While it’s important to be vigilant of how much protein your pup is consuming every day, Orijin’s large breed puppy formula offers a high-quality blend of nutrient-rich, free-range ingredients that are sure to encourage healthy growth in your German Shepherd puppy. Just be sure to consult with your veterinarian about the protein content of this product. Nestlé Purina Petcare is the second-largest pet food manufacturing company in the USA. It’s large breed puppy formula is tailored to develop healthy joints and brains in growing large breed pups. This could be a good choice for someone looking to feed their new puppy a balanced diet catered to large breed needs. The analysis of protein, carbohydrates, and fat in this formula are standard among similar dog foods, and it meets the recommendations of the Whole Dog Journal. While Purina is a popular brand of dog food, it contains low quality and controversial ingredients; and so, it may not be the best choice for your growing German Shepherd puppy. There is a lot to consider when purchasing food for your new German Shepherd puppy, and getting the right information about a product can prove to be difficult. Below are some important questions to consider when you bring your new puppy home. How much should I feed my German Shepherd puppy? Use the guidelines on the dog food container to decide how much to feed your puppy. Before 6 months of age, you should feed your puppy several times a day. After 6 months of age, puppies should be fed only twice a day. Make sure to feed your puppy at set times during the morning and evening to create a routine and minimize the risk of blood sugar problems. What should I feed my German Shepherd puppy? At 12 weeks old, begin to transition your puppy from wet food to dry food. By 3 months old, your German Shepherd should only be consuming dry food. At 8 months, begin to transition your puppy from a puppy formula to an adult formula. When your German Shepherd turns 1 year old, they should be fully transitioned to adult food, and you can cut down their feeding to once a day. Conclusion – What’s is the best? In our opinion, the best product for your German Shepherd puppy is Orijen Large Breed Puppy Food. While the protein content is certainly above recommended levels, this formula contains the freshest ingredients when compared to similar products. With that in mind, we think that Orijen Large Breed Puppy Food is the best dog food for your German Shepherd puppy. Check out the other products below!